Geneva, Switzerland. Language: French. Editor: Charles Lafontaine. 1/1, April 15, 1859-1872. 16 pp., 5-10 francs, depending on destination. 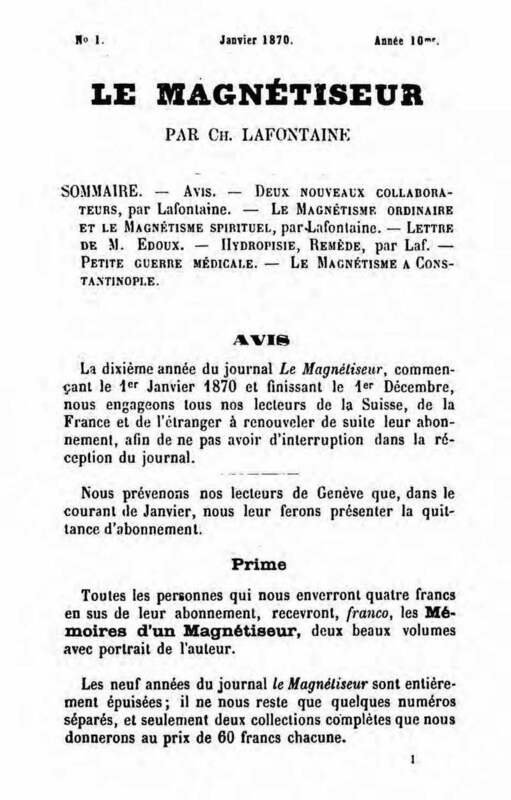 As its name indicates, the journal was primarily devoted to magnetism, but it was also one of the forums for the discussions over spiritualism and the postulated causes of its effects. Crabtree 807. Universitat Zurich. Google Books. IAPSOP materials are licensed under a Creative Commons Attribution-NonCommercial 4.0 International License. IAPSOP respects user and member privacy and personal data rights.